Now Peter’s concise, jargon-free wisdom is available book form. 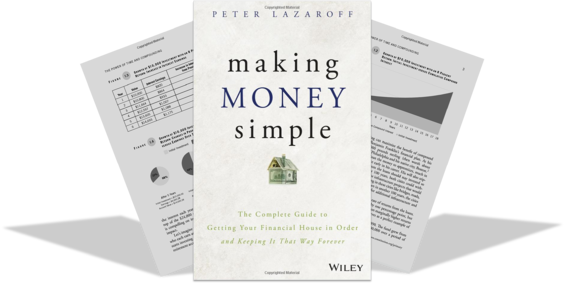 Making Money Simple is geared to people in their 20s, 30s and 40s who are excelling in their careers and want to make sure they are doing the right things with their money. People who are enjoying career success often dedicate years acquiring knowledge and honing their craft. Because money often isn’t part of the story in the early years, it is a topic that gets neglected. The easiest way to do this is to define your goals, develop an optimal savings plan and automate as much of that plan as possible. The purpose of Making Money Simple is to give you a clear starting point, focus only on the most important decisions to make, and create a saving system that quietly nudges your finances in the right direction without regular effort on your part. Please email info@plancorp.com if you would like a complimentary copy of the book for a young person in your life—or even for yourself—and we’d be happy to send you one! Feel free to share his Amazon link with anyone else you think could benefit from the book, as well. Please join Plancorp in congratulating Peter on this exciting accomplishment! I was recently named to one of the 2019 Forbes Best-In-State Advisors. You can view the list in its entirety here. I had the opportunity to talk with Yahoo! Finance about my market outlook for 2019, as well as why losses are a normal part of a healthy, functioning market. I stopped by the CNBC studios this week to discuss U.S.-China trade talks—and strategies for investing in this market.